As its name implies, this Officers Kukri is the blade that is typically given to Gurkha officers in service in India. 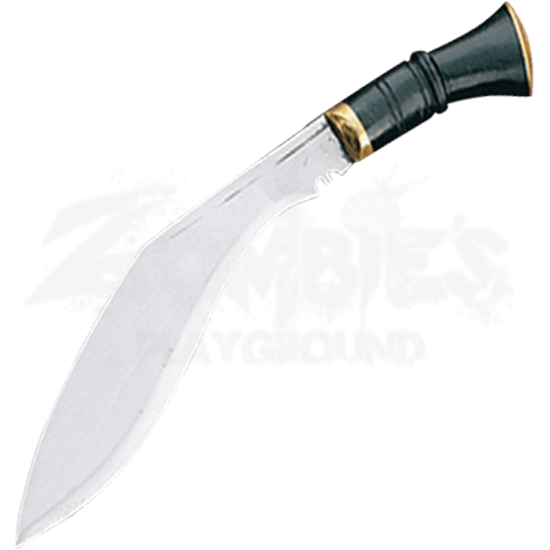 What sets this kukri apart from others is its more ornate grip, although greater detail does not detract from this blades cutting power. Even an officers kukri has to be an effective cutting blade, and so the formula for this knife has not changed much. like the traditional kukri of typical Gurhka soldiers, this blade possesses a forward-swept blade that is sharpened on the inside curve, a combination that makes the kukri strike with impressive force, allowing it to cleave neatly and easily through many different substances. The blade possesses a fuller near the base, as well as a classic trident-notch near the grip, which is simultaneously a religious symbol, a blade delineator, and a blood-notch that keeps blood, sap, and other fluids from dripping down the blade and onto the hand. The contoured handle of this kukri is black and made from genuine buffalo horn, while featuring a brass bolster as well as a brass pommel cap. This kukri comes with a regulation sheath and a factory edge (which can be honed to greater sharpness at a later date). It also includes two accessory knives for keeping the kukri blade sharp, and for various utility tasks that might need a smaller blade. The knife has an overall length of approximately 14 inches, while the blade measures closer to 9.5 inches in length. If this Officers Kukri is good enough for even the officers of the Gurkha, then it is bound to be a good enough blade to enjoy for outdoor tasks that might involve cutting and chopping.